Sunflower Cottage01263 715779work01603 870304fax Self-cateringA pretty, Victorian cottage built in 1835, Sunflower Cottage overlooks the village green at Shouldham. 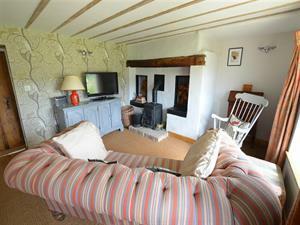 The cottage is spacious and has the advantage of a garden room, 2 en-suite bathrooms and a sunny cottage garden. With the village pub and shop within walking distance, the cottage makes an ideal base to explore west Norfolk and beyond. Cycle paths and walks begin from the village centre or why not re-trace Roman steps along the famous Peddars Way? The market towns of Kings Lynn, Swaffham and Downham Market are all within easy reach and aside from market days are good hunting grounds for antiques and bygones. Interest for coast lovers can be found at the resorts of Heacham and Hunstanton and The Wash National Nature Reserve, which is the largest of its kind in the country. The Royal Estate of Sandringham is in this part of the county and the impressive city of Cambridge is just over an hour's drive away. There is much to see and do is the undiscovered part of Norfolk. Sunflower Cottage offers weekly bookings starting on Friday. A pretty, Victorian cottage built in 1835, Sunflower Cottage overlooks the village green at Shouldham. The cottage is spacious and has the advantage of a garden room, 2 en-suite bathrooms and a sunny cottage garden. With the village pub and shop within walking distance, the cottage makes an ideal base to explore west Norfolk and beyond. Cycle paths and walks begin from the village centre or why not re-trace Roman steps along the famous Peddars Way? The market towns of Kings Lynn, Swaffham and Downham Market are all within easy reach and aside from market days are good hunting grounds for antiques and bygones. Interest for coast lovers can be found at the resorts of Heacham and Hunstanton and The Wash National Nature Reserve, which is the largest of its kind in the country. The Royal Estate of Sandringham is in this part of the county and the impressive city of Cambridge is just over an hour's drive away. There is much to see and do is the undiscovered part of Norfolk.